Income tax for individual is what most tax payers want to know in Budget. In Budget 2016, the finance minister has made little changes to this. 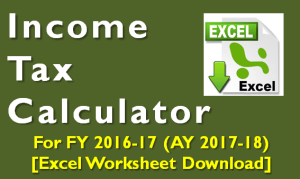 We highlight the changes and give you the new tax calculator for FY 2016-17 [AY 2017-18]. 1. There has been no change in the income tax slabs. 2. For people with net taxable income below Rs 5 lakh, the tax rebate has been increased from Rs 2,000 to Rs 5,000 u/s 87A. This would benefit people who have net taxable income between Rs 2.7 Lakhs to Rs 5 Lakhs. 3. Additional exemption for first time home buyer up to Rs. 50,000 on interest paid on housing loans. This would be applicable where the property cost is below Rs 50 Lakhs and the home loan is below Rs 35 lakhs. The loan should be sanctioned on or after April 1, 2016. 4. Tax Exemption u/s 80GG (for rent expenses who do NOT have HRA component in salary) has been increased from Rs 24,000 to Rs 60,000 per annum. This is a good move to align the exemption amount with today’s rent and keep the section relevant. 7. 40% of lump sum withdrawal on NPS at maturity would be exempted from Tax. This rule now also applies to EPF. So now in case of EPF income tax would be applicable on 60% of the corpus on maturity. 8. Presumptive taxation scheme introduced for professionals with receipts up to Rs. 50 lakhs. The presumptive income would be 50% of the revenues. There is no change in income tax slabs except additional 3% increase in cess for super rich (i.e. individuals with income > 1 crore). For Income Tax Purpose – citizens above age of 60 are considered as Senior Citizens and above age of 80 are considered Very Senior citizens. You can also download Income Tax Calculator for FY 2015-16, FY 2014-15, FY 2013-14, FY 2012-13 and FY 2011-12 by clicking on respective links. If senior citizen saving scheme done on 03032017 income-tax can be claimed at 80C for financial year2018-19. Q1. My father is suffering from Blood Cancer and his treatment expenses have been reimbursed into my salary against the actual bills submitted, so what will be the tax implications on it? 2. No tax rebate for under-construction flat. Tax benefit on home loan can be claimed only after possession. I was working in a PSU. I left my job in April 2017. There was a bond of 3 lakh which was paid from my account. I took money from my family and friends. I started online blogging and earning about 1 lakh per month. I paid 1.5lakh which I borrowed from friends. Till now, I have received around 6 lakh from blogging in my bank account. I have 2 lakh in my blogging site which I am not sure to transfer into my bank account or not due to high-income tax. I want to ask that the money I borrowed for paying bond amount will be shown as income or not. How should I file my income next year? I read somewhere that I can file as a business. In that case, should I have to register myself somewhere? Can I show depreciation on my assets? Should I transfer the rest amount in my bank account? What should be best for me? I do not want to pay much tax. I can invest 1.5 lac under 80C but even after that, I have to pay around 1 lakh tax even if I do not credit my account with the rest of the money. I have received insurance maturity amount Rs. 801904 from ICICI Prudential Life Insurance Co and TDS Deducted Rs.8020/- i have no any other income, please help me for calculation tax liability. Check if your maturity amount is taxable @ How are ULIP & Life Insurance Policies Taxed on Surrender & Maturity? My employer Kamrup Housing projects Pvt. Ltd. , Greater Noida has given me only 7 month salary in Financial year 2106-2017, balance 5 due with him . Even employer not submit TDS of any quarter in this 2016-2017. How can I file my Return ? please suggest…. You can file your returns based on salary slips and if TDS has been deducted from salary you can claim the same – irrespective of TDS is deposited by employer or not. Unfortunately this is going to be cumbersome process. Here are some links that might help you – If your employer defaults on TDS payment and What if your employer does not pay salaries or fails to deposit TDS or PF? which is 5 years & it qualifies for tax exemption — provided there was no monthly break in between! I have taken some amount as final settlement from previous employer. And I got Form 16 from current employer. But in that the details from previous employer is not added. What shall do to file ITR. Do i need to add the amount received from previous employer to the gross of current employer and file? 1. Can we claim tax benefit for both loans. If yes, will interest of both loans be added and then divided as per share in property between me and my spouse. If share is 50 – 50 does that mean the tax benefit will be for 50% of interest component for both. In my case interest on 10L loan is around 90K and for 25L it is around 2.12L. So total int is 3L. Does this mean we both can avail 1.5L tax benefit in lieu of interest paid? Please share the TDS salary calculator in excel sheet with formulas for the year of “2016 -2017” and “2017-2018” on my mail ID. I haven’t invested anywhere and my income this FY is 8-9 LPA, can you guide me on the best options to invest to save taxes and save money. As you had more than 5 years of service your EPF is tax free. Your taxable income is Rs 3 lakhs which would incur 0 tax! Is it a) (10% of 11 lacs ) OR b) 10% of 1 lac ie excess amount over 10 ? This part has not been added to the excel calculator. d) Exclude dividend so his income being 90 lacs hence no surcharge. Q1 …Which one is correct ? a or b ? Q2.. Which is correct ? c , d or e ? Just put the numbers in calculator and you’ll get the tax applicable to you. You’ll get your tax refund once you file your your income tax return in July 2017. You may find 15 Personal Finance Tips for your First Job useful.